Kelly has a virtual sleepover for her birthday in this scary You’re Invited to a Creepover tale. Birthday girl and queen of all things spooky, Kelly Garcia is all set to have the perfect night. First her parents are going out of town. And although they hired a babysitter, Kelly is excited to basically be on her own. And then there’s the sleepover she’s having—a virtual, webcam sleepover where she and her friends can scare each other silly by telling ghost stories and summoning the spirit of Miss Mary, a woman from their small town who died tragically a long time ago. But when her friends start disappearing one by one and the babysitter is nowhere to be found, Kelly starts getting scared…for real. Is Miss Mary’s ghost kidnapping everyone? Will Kelly be next? This creepy tale is a level 5 on the Creep-o-Meter. “They’re not coming back,” Ryan Garcia announced. “What?” Kelly demanded. Gray slush from her boots fell in clumps onto the woven mat by the front door, leaving behind small pools of water. The warmth of the house felt good. The bus was like a freezer on wheels, and she was starving. Friday was Taco Day at school. So totally beyond disgusting, and of course, her mom hadn’t packed her any lunch. For the last hour, she’d been thinking of nothing but the package of chocolate cookies waiting in the pantry. “Mom and Dad,” Ryan added. At ten years old, Ryan delighted in taunting her with secrets. His days were spent scheming to possess more information, as if it made him smarter or more grownup. He still hadn’t clued in: She didn’t really care. Usually. Ryan watched her open the pantry and grab the foil package. She slid out four cookies. They were the oversize, hockey-puck kind. Four seems like the right number to make up for lunch, Kelly reasoned. She ate the first one and let him wait. She knew he wanted her to ask again. To beg for more information. Ryan fidgeted, trying so hard not to tell her anything until she asked. She ate the second cookie, chewing slowly. “So?” she finally said. “So . . . we’re all alone,” Ryan reported. He looked unsure. Kelly took a deep breath, annoyed that her brother had almost scared her. It was only for a second, but still. That’s my job, she thought. Everyone knows that I’m the best at scaring people. “When did they call?” Kelly asked, biting into another cookie. And just at that moment, the phone rang. “Guess that’s them.” Kelly hurried to the phone on her mother’s desk in the far corner of the kitchen. Her mom referred to her desk as “Command Central.” In the middle sat a huge calendar with all their activities, and scattered about were school directories, recipes printed from the Internet, magazines she hadn’t yet read, and a whole mess of other papers. Kelly never understood what gave her mother the right to be on her case about cleaning her room when her desk was such a disaster. “Hi,” Kelly said, sitting on the wooden desk chair. “Kelly, honey, I’m so glad you’re home,” her mother panted. She sounded strangely out of breath. “Of course I’m home. Got to get ready for my party. Lots to do,” Kelly reminded her. “Ryan told me.” She glanced above the desk at the enormous bulletin board covered with articles and downloads. Her mom, among a million other things, wrote a column for their weekly town paper called It Happened Here. It was about all the unimportant things masquerading as history that had happened in their little Vermont town since the French trappers first arrived. Kelly kept telling her mom no one cared. But the editors kept asking for columns. She guessed it gave the newspaper a reason to exist, because there was certainly no real news going on in her town. The bulletin board was like a mini history lesson, if anyone cared to read the columns, which she didn’t. Kelly usually just read the captions to the photos while she was on the phone. “It’s snowing like crazy here. They canceled all flights out of the airport.” Her mom sounded tired. She’d been up since dawn. “Oh. Okay.” Kelly had never stayed alone in the house overnight. She felt fine with it, though. She had babysat for little kids down the street, and that was no big deal. She could totally handle Ryan. Between the TV and his video games, he’d stay out of her way. Besides, Paige and June were sleeping over tonight. An early birthday celebration. She’d have company. “Daddy and I will leave first thing in the morning to get back home,” her mom promised. Kelly could hear the worry in her voice. “What, Dave? How can they not have rooms? Look, the meeting wasn’t my brilliant idea. It’s fine . . . whatever . . . anywhere . . .” Her mom argued with her dad in the background. They had a company together, Authentic Vermont Blankets. Supposedly there was something about the sheep in their state that made superior wool for blankets—or at least, that was what her parents advertised. They had flown to Philadelphia this morning to try to convince some big store to sell their wool blankets instead of Amish quilts. Kelly peered at a photocopy of a news clipping on the bulletin board about a woman named Mary Owens. She had never noticed this one before. The picture showed a young woman wearing a mod 1960s minidress and tall white patent-leather boots. A one-of-a-kind homemade necklace was draped about her neck. She sat serenely on a sofa, a playful smile on her thin lips. A Christmas tree decorated with candy canes filled the space behind her. “Sure.” She studied the perfect swoosh of Mary’s chestnut hair across her forehead. She wondered if her shoulder-length dark-brown hair could do that too. Doubtful. Kelly tore her gaze away from pretty Mary Owens. “Chrissie Cox? Why is she bringing us dinner?” Chrissie was her best friend Paige’s older sister. “That’s not fair! It’s not my fault there’s a storm. It’s my birthday!” Kelly cried. “No, it’s not,” Ryan piped in behind her. She shot him an evil glare. He crossed his eyes at her. “Real mature,” Kelly muttered. Kelly groaned. Typical of her mother. She always moved holidays to suit her own schedule. They often had Thanksgiving on a Sunday so her mother’s whole family could drive in, and Easter on a Saturday so they didn’t have to fight the weekend traffic home from Boston. “But—” She had planned so many great things for tonight. “Okay.” She sighed. She wasn’t happy, but she didn’t have a choice. She knew that. No sleepover. She passed the phone to Ryan. As he babbled about some science project in school with pennies and sugar water, Kelly took a closer look at Mary Owens. The caption under the picture said the photo had been snapped at a Christmas party right before her untimely death. Kelly stood on the chair and unpinned the article. She began reading from the beginning. All the while, she had the strangest feeling that the gaze of the young woman in the picture was fixed on her. Wanting her to know what had happened. Mary’s story was so tragic. Killed in a freak avalanche. Suffocated under the weight of the snow. Staring into her soulful eyes, Kelly wondered what it felt like, alone, buried under all that whiteness. “One of Mom’s articles. Scary stuff.” She pinned it back onto the bulletin board before he could reach for it. “I’m going to my room.” She glanced out the window over the sink. The sky remained its usual winter gray. Thick clouds but no storm. All this craziness over nothing, she thought. I’ve been looking forward to this sleepover all week, and now I have to sit here with a babysitter, totally bored. She had no idea of the horrors that lay ahead. 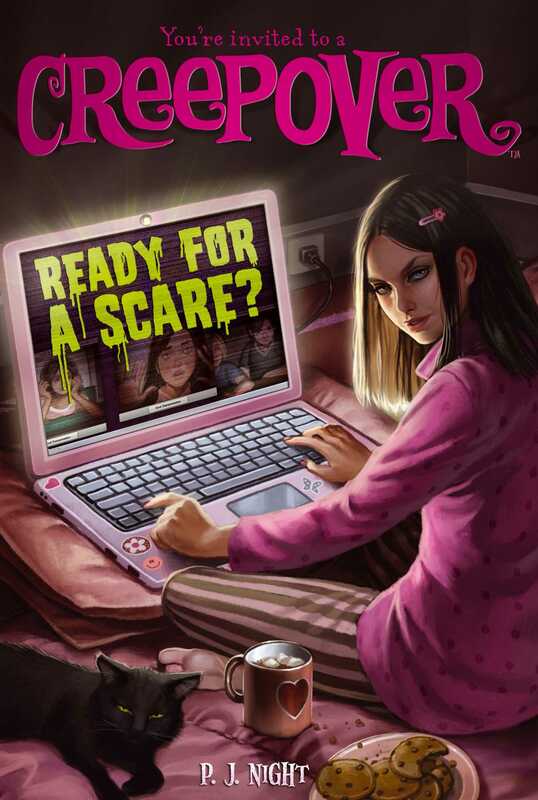 Book Cover Image (jpg): Ready for a Scare?